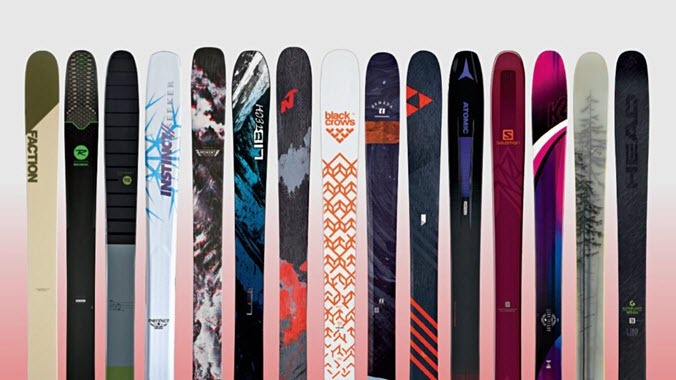 Colorado has 53 mountains over 14,000 feet with an additional five summits that make most peakbaggers’ 14ers rosters (the rule is that mountain tops must have 300 vertical feet of prominence between neighboring summits). While they are all scenic, some are less-than-wonderful to scale: rotten rock, tedious boulder fields, and private land ownership issues make some of the Colorado’s highest peaks a chore. 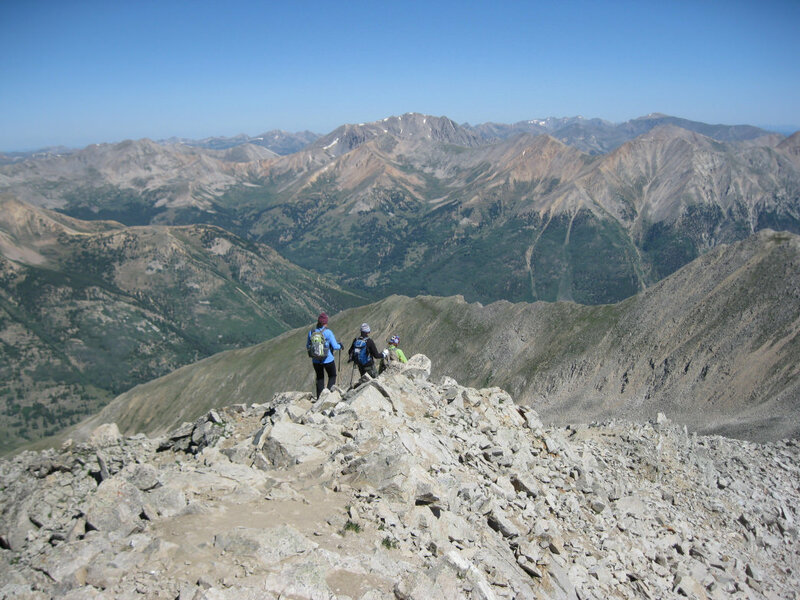 So when it comes to selecting the best 14ers to ascend, the journey is every bit as important as the destination. 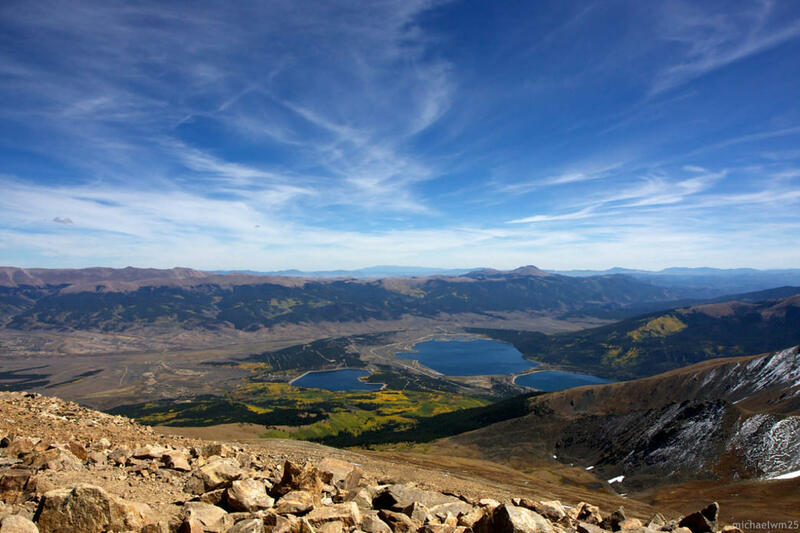 These ten summits range from simple hill walks to thrillingly exposed class 4 scrambles and they embody some of the most enjoyable, challenging mountain adventures in Colorado. Colorado’s highest summit is a grandfatherly gentle giant, at least by Rocky Mountains standards. 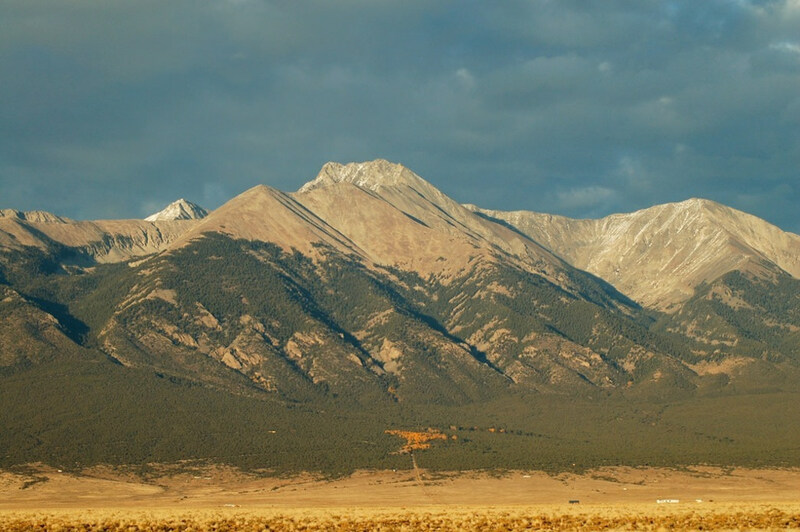 Elbert’s large, rounded dome is easily accessed by several trails, all of which begin in vanilla-scented pine forests and emerge from treeline with stunning views of the Sawatch Range. That’s not to say it’s a walk in the park — there’s a matter of 4,400 feet of elevation gain over 4.5 miles to deal with — but the paths are well maintained and easy to follow. Reach the top and you’ll be in the heart of the highest mountain range in the lower 48 US states. 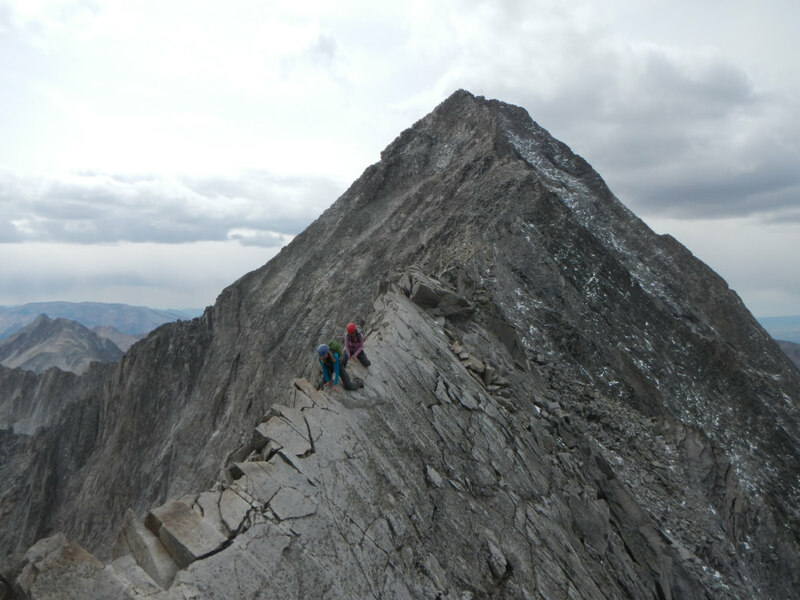 The famous knife edge on Capitol Peak. 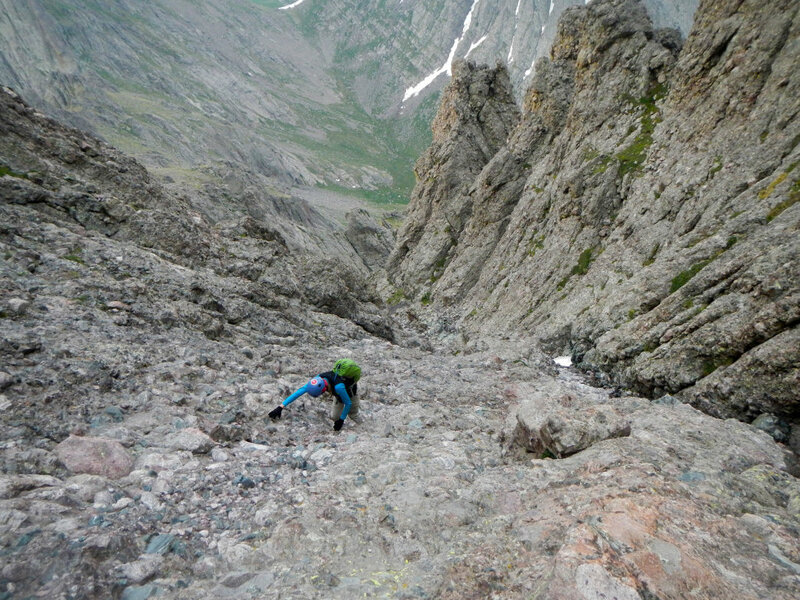 Amongst the most challenging 14ers, Capitol is tough for the right reasons — solid rock, heart-in-your-throat exposure and tricky but fair route finding. It’s an 18 mile round trip to complete this epic journey — and that’s part of the joy. A long approach along Capitol Creek passes through gorgeous aspen forests and ends at Capitol Lake, where the real work begins. After navigating a steep pass, honest class 4 rock makes for a spectacular path to the summit, including the notorious knife edge traverse. 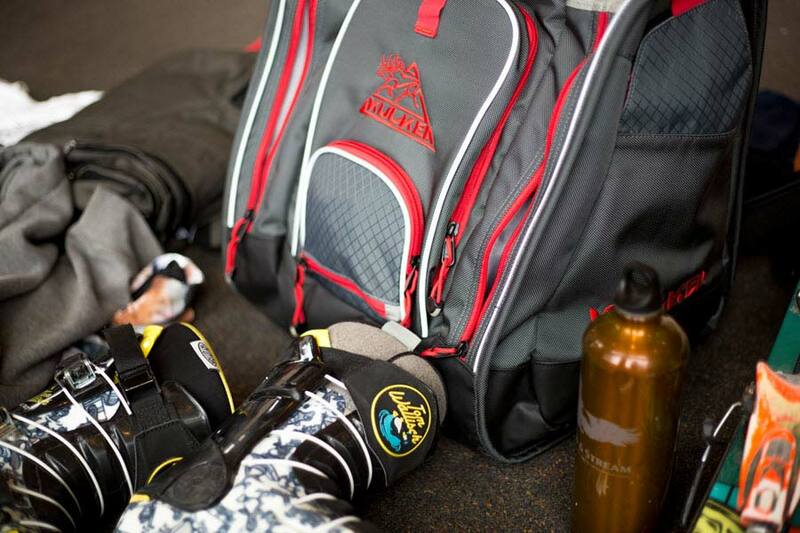 Savvy climbers know the top is only the half-way point — the way down is just as fun and demanding as the ascent. On the approach to San Luis Peak on a cloudless day. San Luis Peak is located in a remote portion of the San Juan Mountains near the town of Gunnison, Colorado — almost smack dab in the middle of Colorado’s Rocky Mountains. Its isolation is part of its charm. A summer venture to San Luis follows several peaceful creeks and the area is regularly festooned with a vibrant field of wildflowers. Views are expansive throughout the adventure and as the alpine grasses yield to the rocky terrain of the summit block, the trail remains in tact and easy to navigate. The summit views are pristine, rolling and nearly absent of any man-made landmarks. 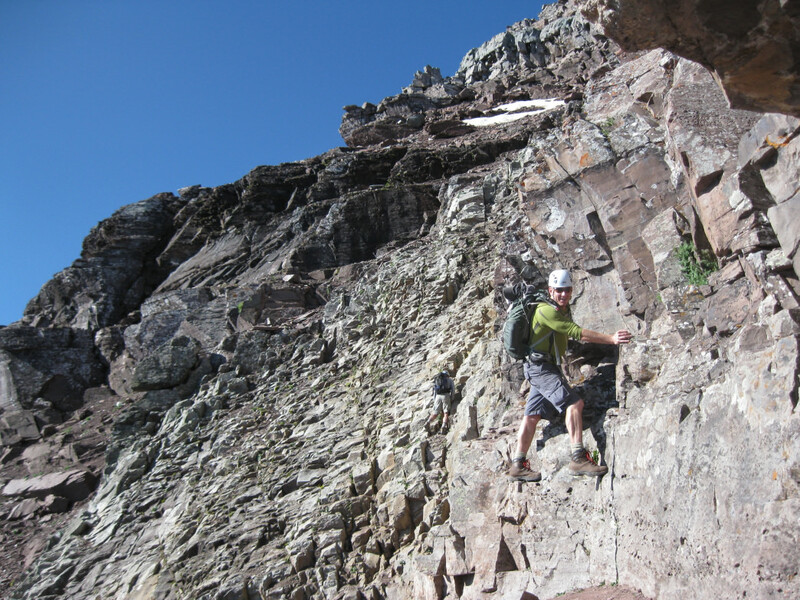 Crestone Needle is a stunning mountain to behold and a vexing peak to navigate. Despite sporting a well-worn trail to its upper reaches, the rocky gullies that offer passage to the summit are easily confused. However, the knobby stones that make up the hide of the peak are impressively solid, and the standard scramble to the top is arguably the best in the state. Vigilant navigation will unlock the secrets of the Needle’s imposing passage — one nearly all climbers brag about after the experience. 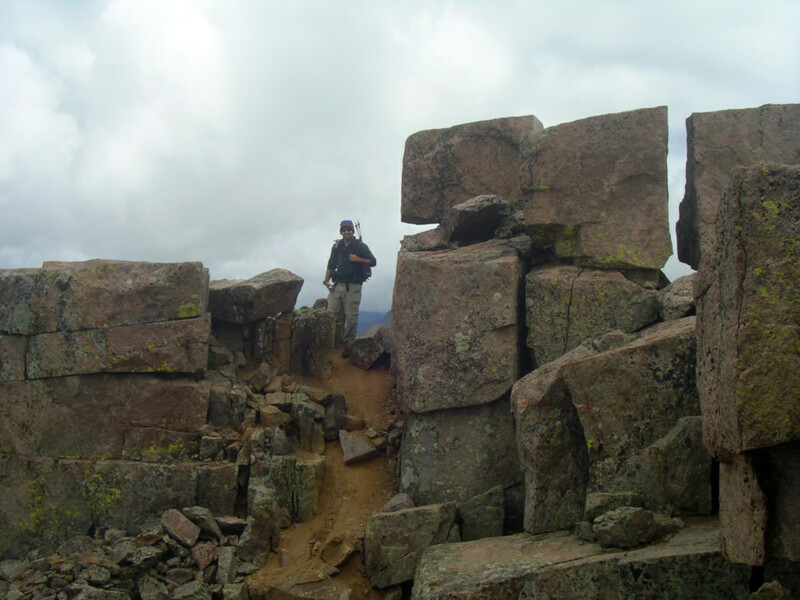 Hiking the narrows on Longs Peak. Longs is far and away the most popular difficult 14er — most climbers would put it around the 10th most challenging summit on the list. Yes, there will be crowds and only 50% of those who attempt Longs make its broad, flat summit. But the adventure of this Front Range classic is without peer. After a long 5.5-mile approach, hikers go through the magical Keyhole rock feature and enter a new world of dark rock bands, steep scrambles, narrow ledges and a wild crawl to the final summit. Despite over 14 miles on the round trip standard route, most people will attempt this burly mountain in a single day. 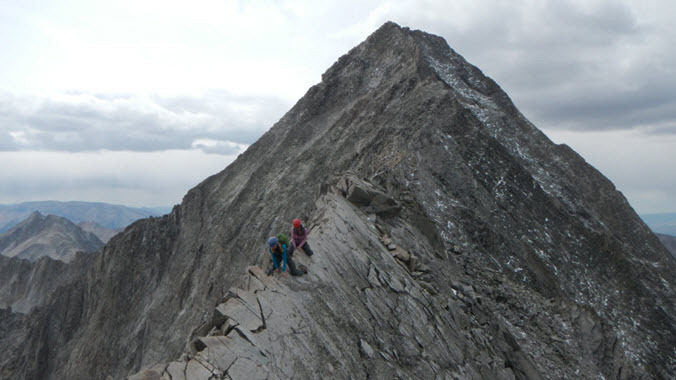 A trip to Blanca Peak is as much about the approach as it is the actual peak. At the foot of this impressive massif are the great dunes of Sand Dunes National Park (a feature easily admired from the summit on a clear day). Hikers must travel through a wonderful shift of eco-systems, starting with desert-like tundra all the way to lush, alpine lakes. A rocky, rugged trail to the top brings hikers to the ultimate view of all the landscapes they have traversed along the way — not to mention contrasting vistas of gentle farmland and the rugged summits of the Sangre de Cristo Range. The summit blocks on Windom Peak. Windom is one of a trio of officially ranked 14ers (and one unofficial summit, North Eolus) in Chicago Basin. 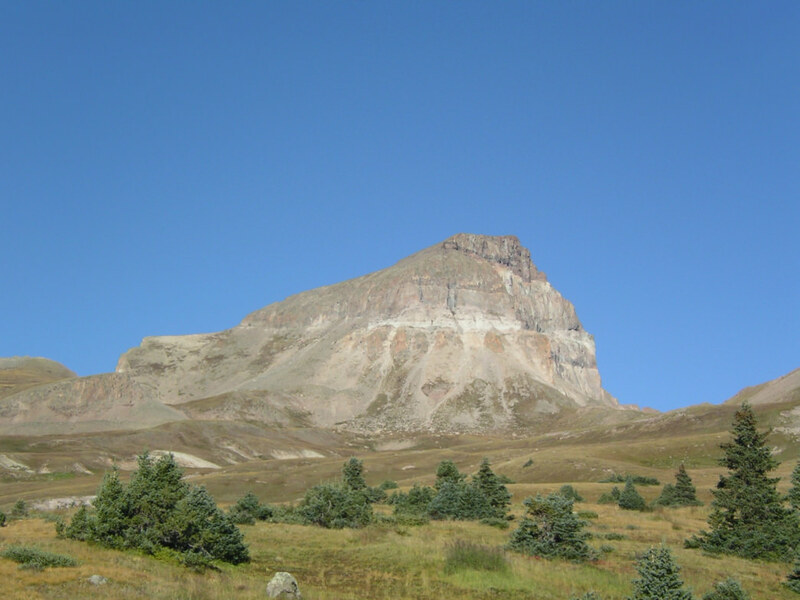 Its neighboring 14ers — Sunlight Peak and Eolus Peak — are class 4 and 3 ascents respectively, so modest Windom sits alone as the “everyman” mountain in the area. What makes this one a true classic is the access — most often done by the coal-powered train that runs along the Durango-Silverton Narrow Gauge Railroad. 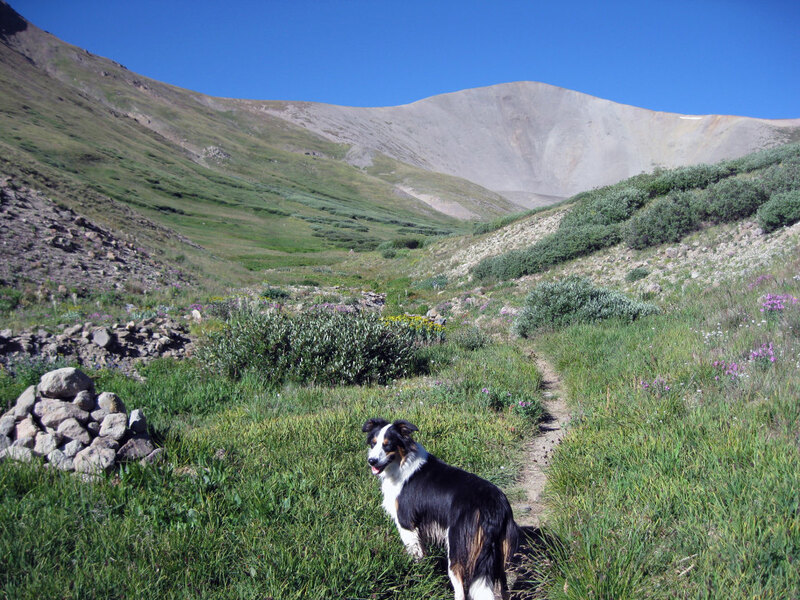 Midway through the adventure, hikers disembark into the mountain-goat friendly San Juan mountains. 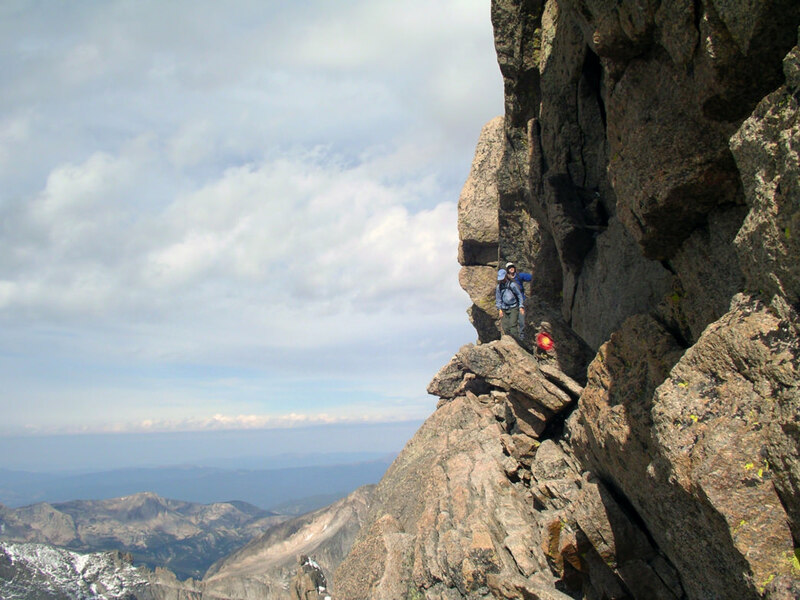 Windom itself is a steep climb, accented by blocky boulders and easy scrambles. While easier than its counterparts, it may have the best views and the most enjoyable route to the top. Uncompahgre’s famous sinking-ship profile is flanked by rolling fields of deep green grass and patches of colorful wild flowers. Because it is located in the San Juan range, it tends to get more rain than northern and central peaks, meaning it is awash in color. Trails to the summit travel along long, expansive meadows and fun, scrambly corridors. Atop the peak, nearby 14er Wetterhorn Peak cuts a crooked profile and southwestern hues of yellow, bronze and orange stripe the landscape in amazing relief. Traversing below the Green Gully on Pyramid Peak. Pyramid Peak may not be as scenic from a distance as its neighbors, the iconic, beautiful Maroon Bells , but up close it’s quite a treat. Whereas the twin summits of North and South Maroon peaks are made up of crumbly, unreliable rock, Pyramid is made of slightly sterner stuff. The upshot is a solid scramble that is less unpredictable and stays along a path that minimizes exposure (though there are a few spots that will get your attention). Handholds and footholds are always available and the summit is often shared with resident mountain goats, who make scaling the cliffs of Pyramid Peak seem way too easy. The final 14er in this list is cut from the classic, mountainous contour of the Rockies — a high, triangular peak that juts into the clouds. Huron has one of the best trails to any summit in the state. As it runs through pine forests and into broad, alpine meadows, views of nearby Sawatch Peaks and Hope Pass are pure Colorado. In the autumn, the colors in this area are a photographer’s dream. The last section of the trail to the top has a few easy scrambles that politely lead climbers away from from the drafty edges of the peak. Summit views are of course glorious, especially for those ambitious enough to catch a sunrise or sunset from the apex of Huron Peak. Author and Images: James Dziezynski for RootsRated. Moab Mountain Biking 101: What to Know, Where to Go. Chillin with Silver Medalist Nick Goepper. 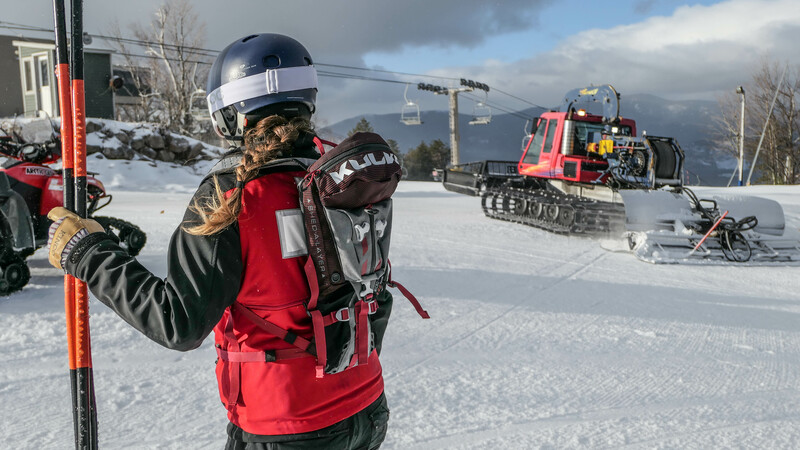 Aging to the Extreme with Hall of Fame Skier John Egan.